Beretta took everything great about the 92F and made it even sweeter for concealed carry. A shorter barrel is very welcome on this CCW piece as is the shorter grip. With an accessory rail thrown in for good measure, Beretta delivered a powerhouse for us compact pistol lovers. If you’re going to carry this sweet pistol in a Beretta 92 Compact holster, make sure it’s built for concealment. Some holsters are designed to be a duty rig. That may be fine for an officer of the law or security guard but not for concealed carry. The Beretta 92 Compact concealed carry holsters offered by Clinger are indeed built with concealment in mind. Although this 92 Compact is smaller than its big brother, it’s still difficult to conceal in a holster that wasn’t designed around concealment. 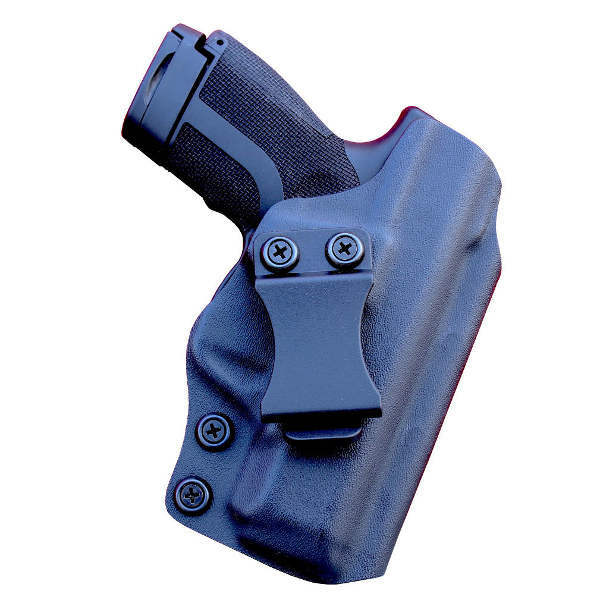 The No Print Wonder is the perfect concealment holster for the 92 Compact. The biggest problem with concealing this pistol is usually printing. The pistol tends to protrude through the back of the shirt of the person carrying it. This doesn’t have to be the case though. Our Beretta 92 Compact Kydex holsters conceal this pistol well by ensuring that the pistol is pulled in close to your side rather than protruding thought the back of your shirt. Our No Print Wonder uses our Cling Tab to pull the grip in close while its Flex Tab flexes around your waistline. This ensures your Clinger Holster pulls the grip in close. Our Beretta 92 Compact OWB holsters and IWB rigs have many adjustments available. You can adjust the ride height of the pistol just by moving the belt clips on the holster. In addition, the cant angle can be adjusted the same way. Adjustments are very important on a concealed carry holster. You just won’t carry your pistol every day if you can’t do it comfortably. In addition, you deserve to carry your favorite pistol without worrying about your Beretta 92 Compact IWB holster’s performance. Rest assured, Clinger holsters are built around concealment. We achieve high levels of achievement with a small foot print and our Cling Tab system. Clinger Holster offers a Lifetime Warranty on our Kydex holsters. Our holsters are built tough enough to last a lifetime but should your holster happen to break, you won’t have to worry about a convoluted warranty policy. We’ll take care of you. Clinger offers many Beretta 92 Compact holsters to accommodate your concealed carry preferences.